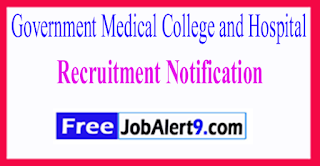 GMCH (Government Medical College and Hospital) Has Released Recruitment Notification For 111 Senior Resident, Medical Officer, Demonstrator Posts. 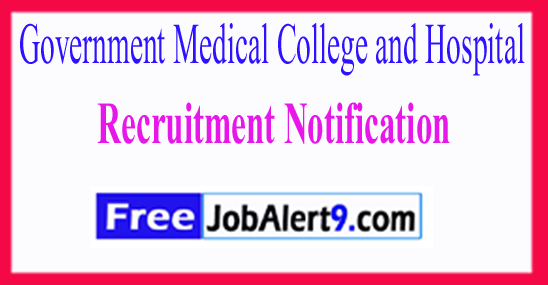 All Eligible & Interested Candidates Can Apply Online.Further Detailed Information Regarding Educational Qualifications, Age Limit, Selection Procedure, Exam Pattern, Syllabus for GMCH (Government Medical College and Hospital) Recruitment 2017 - 111 Senior Resident, Medical Officer, Demonstrator Post is mentioned below. Candidates upper age limit should not Exceed 30 Years (MBBS), 33 Years (Post Doctoral Degree). All Eligible Candidates will Be Selected Based on Their Performance In Written Exam, Inter-view . Rs. 67,700/- (Post 1), Rs. 10,300 - 34,800/- With 5000/- Grade Pay (Post 3), Rs. 15,600 - 39,100/- With 5400/- Grade Pay (Post 4) . All Eligible & Interested candidate fill the online application through official website (http://www.gmch.gov.in). After successfully submitting the application, candidate must send by hard copies of application a long with relevant testimonials to the following Address before / (21st June 2017). Office of Director Principal, Dairy & Dispatch Section, Room No. 228-A, Block-D, GMCH-32, Chandigarh . Deadline for Online Application Form Is - 21-06-2017. Last Date of Application Form Is - 23-06-2017. Date of Written Examination - 29-06-2017. Click Here For GMCH Recruitment 2017,Advertisement.